This section of the manuscript is a list, arranged in calendar order, of the days on which benefactors to Christ Church, Canterbury, died. It enabled the community of monks to remember their benefactors on the anniversaries of their deaths. Dates are marked in red in the left-hand margin, according to the Roman calendar, and to the right of these are entries recording names and gifts. At the top of this page, for example, is King Edward, who gave property in 'Cherteham' (probably Chatham or Chartham, both in Kent) and 'Waleworth'. 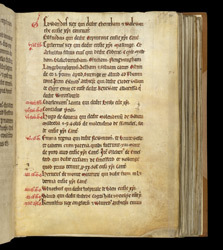 This is followed by Eilfnodus, who gave property in Orpington; King Egbert, who gave property in Malling; and so on.